After rallying in Anaheim, Hawks let one get away in OT against Kings. LOS ANGELES—Marian Gaborik scored the tying goal with 5:55 left in regulation and added his fifth of the season 2:04 into overtime, lifting the Kings to a 3-2 victory over the Blackhawks on Saturday night. ”It was tough today, but our team never quits until the last whistle,” Kings defenseman Drew Doughty said. Gaborik spoiled a record-setting night for Patrick Kane. The winger broke an NHL mark for U.S.-born players with a point in his 19th consecutive game, scoring on a power play and assisting on Niklas Hjalmarsson‘s first goal of the season.Kane leads the league with 37 points, and 31 of them have come during the streak, which eclipsed the record previously shared by Eddie Olczyk and Phil Kessel. Olczyk is a color commentator for Blackhawks games and Kane knows him well, and Kessel was Kane’s teammate on the U.S. Olympic hockey teams in Vancouver and Sochi. The Blackhawks beat Anaheim 3-2 in overtime on Friday night after trailing 2-0 with less than 2 minutes left. In this one, they blew a 2-0 third-period lead.It was the first time the defending Stanley Cup champions lost when leading after two periods in the regular season since April 12, 2014, when the Nashville Predators rallied from a 3-2 deficit at home to win 7-5. The Hawks had won 34 straight since then.Jeff Carter ignited the Kings’ comeback, converting his own rebound 52 seconds into the third.Gaborik got the equalizer with a short wrist shot from the slot after defenseman Brent Seabrook overskated the puck while trying to carry it out of his own end and lost it to Anze Kopitar. His second game-winner of the season came on a shot that beat Scott Darling low to the stick side.Playing in his 600th regular-season game, Kane opened the scoring with his 14th goal of the season at 11:10 of the first on the power play. It was the sixth man-advantage goal allowed by Los Angeles in its last six games.Kane is two games shy of the Blackhawks’ franchise record for consecutive games with a goal or an assist, set by Bobby Hull during the 1971-72 season.The last time Kane was held off the scoresheet was Oct. 15 at Washington. The longest point streak in NHL history is 51 games, by Wayne Gretzky with the 1983-84 Edmonton Oilers.Quick stopped 20 shots, including a breakaway by Andrew Shaw at 11:15 of the second period. Hjalmarsson made it 2-0 at 12:56 of the second, ending a 29-game goal drought by the defenseman since his goal against the Kings on March 30.It was the second meeting of the season between the Kings and Blackhawks, who have each won two of the last four Stanley Cup championships. The defending champion Blackhawks also beat the Kings 4-2 at the United Center on Nov. 2. NOTES—The Kings were 10-15-0 against the Blackhawks during the four seasons in which they took turns winning the Stanley Cup, including postseason play. The Hawks beat Los Angeles in five games to win the 2013 Western Conference finals, and the Kings returned the favor the following year by beating the Blackhawks in a seven-game conference final that was decided by Alec Martinez‘s overtime goal. … Darling’s only other start against the Kings was back on March 3, when he made 31 saves in a 4-1 victory at the U.C..
STANFORD—Kevin Hogan threw four touchdown passes and drove No. 13 Stanford to the game-winning 45-yard field goal by Conrad Ukropina on the play of the Cardinal’s 38-36 victory over No. 4 Notre Dame in a playoff elimination game Saturday night.Hogan threw for 269 yards and calmly led the winning drive in the final 30 seconds for the Cardinal (10-2, No. 9 CFP), who kept their slim playoff hopes alive with the win. Stanford needs to beat Southern California in the Pac-12 championship game next week and then get help in the other title games to make the four-team playoff.DeShone Kizer had given the Irish (10-2, No. 6 CFP) a one-point lead on his 2-yard run with 30 seconds left only to see Hogan drive Stanford to the win. After Northwestern’s 10th victory of the season, coach Pat Fitzgerald took the blame for last year’s disappointing loss to Illinois, and then took aim at the College Football Playoff Committee.Justin Jackson rushed for 172 yards and a touchdown, and the 17th-ranked Wildcats beat the Illini 24-14 at Soldier Field on Saturday.Freshman Clayton Thorson threw for 146 yards and a score as Northwestern (10-2, 6-2 Big Ten, No. 16 CFP) avenged last year’s 47-33 home loss to Illinois. It was the fifth consecutive win for the Wildcats, putting them in position for a Jan. 1 bowl game. ”This game last year, I walked into the locker room, and not to take any credit away from our opponent, I was very self-critical,” Fitzgerald said. ”I really felt like I failed the team. We had 30-plus guys out in this game a year ago and I was not going to let that be an excuse for our failure and our performance, so it wasn’t the guys fault that were out there, it was my fault as the leader of the program that I didn’t do enough to get the next group of guys ready.” Fitzgerald then directed his frustration to what he thinks is a lack of respect for his team in the rankings. Specifically, Stanford is ranked higher than Northwestern despite the Wildcats’ victory over the Cardinal in the season opener. ”I don’t get it. Pop on the tape and watch the film,” he said. ”Our kids dominated that game and I don’t think they give them credit. We didn’t win by 50 today, so we’ll continue to get disrespected from that standpoint. We played a very competitive schedule. We had two bumps in the road. I think our overall performance speaks for itself so I look forward watching the College Football Playoff Committee get it right over the next two weeks. I know they will.” A few hours before Illinois (5-7, 2-6) took the field, the school announced interim coach Bill Cubit had agreed to a two-year contract. Cubit took over for the fired Tim Beckman right before the season started. ”I’m looking forward to the challenge,” Cubit said. ”I really am. I think we’re this close. We just got to go out there and recruit. I think there’s enough people out there.” Wes Lunt threw for 241 yards and Ke’Shawn Vaughn had 62 yards on 12 carries, but the Illini lost for the sixth time in their last 10 meetings with the Wildcats. Lunt praised the decision to bring back Cubit. ”I think it means a lot just to the stability within the program with so much going on,” he said. ”To have him named as the head coach I think puts a little ease with the underclassmen.” In front of a sparse crowd for an Illinois home game as part of the Windy City Series, Vaughn ran 16 yards to set up a 1-yard keeper by Lunt that gave Illinois a 7-0 lead with 8:59 left in the first quarter. Then Northwestern took over. Dan Vitale made a juggling catch and dove into the end zone for a tying 19-yard touchdown reception. A personal foul on Illinois’ Caleb Day for leaping over the punt shield set up Warren Long’s 3-yard touchdown run with 1:21 left in the first, giving Northwestern a 14-7 lead. ”Clayton put it exactly where it needed to be,” Vitale said. ”He put it outside where they couldn’t undercut me. Luckily, I kept my concentration and got in.” The Wildcats kept up the pressure in the second quarter. Miles Shuler had a 39-yard reception and Jackson carried the ball in from the 3 to make it 21-7 with 11:41 left in the half.Linebacker Mason Monheim’s 58-yard interception return for a touchdown gave Illinois a flash of hope in the third quarter, but the Illini hurt themselves with a couple of big mistakes.Matthew Harris picked off a Lunt pass at the Northwestern 19, and offensive tackle Christian DiLauro was flagged for a false start on fourth-and-1 at the Wildcats 4 on another promising drive. Taylor Zalewski then missed a short field-goal attempt.Jack Mitchell made it a two-score game with a 39-yard field goal in the fourth quarter, giving the Wildcats a 24-14 lead.The loss put a damper on Cubit’s promotion. The hiring fills one of several top positions at Illinois opened by months of turmoil in athletics and elsewhere on campus.Interim athletic director Paul Kowalczyk, who took over when Mike Thomas was fired Nov. 9, said Cubit earned the job. ”I think Bill is imminently qualified,” Kowalczyk said. ”Obviously, he’s been a head coach. He knows what has to be done to run an organization like this and a program like this. Some folks aren’t ready for that for that move, but Bill knows.” NU defensive back Nick VanHoose took a knee to the helmet while breaking up a pass in the second quarter. VanHoose was hit by Nate Hall as he dove to the ground. VanHoose was alert and acknowledged teammates as he was carted off the field. School officials said he suffered a laceration. ANAHEIM—The Blackhawks‘ visit to Honda Center on Black Friday for a meeting of Western Conference powers has become an annual NHL staple in recent years.In another new tradition that isn’t limited to holidays, the Blackhawks always seem to find remarkable ways to ruin the Ducks’ day.Artem Anisimov scored 1:53 into overtime, and the Blackhawks rallied from a two-goal deficit in the final moments of regulation for a 3-2 victory over the Ducks.After 58 scoreless minutes in which the Blackhawks largely were dominated, the defending Stanley Cup champions roared from behind in their first trip to Anaheim since winning Game 7 of the conference finals here six months ago.Marian Hossa and Duncan Keith scored man-advantage goals in the final 1:41 of regulation before Anisimov ended it with his 10th goal, delighting the usual hundreds of Blackhawks fans in the sellout crowd. ”Well, I don’t think that is the way we’d like to draw it up, but we’ll take the win,” Keith said. ”I thought they outworked us most of the game. We just found a way at the end and snuck out with the two points.” Brent Seabrook assisted on all three scores in the Hawks fourth straight win at Anaheim on Black Friday. They won the final two games of the conference finals before claiming their third Stanley Cup title in six years. ”It’s a good rivalry we have going with them,” Patrick Kane said. ”It’s fun when you kind of stick with it the whole game. No one really panics.” With an assist on Keith’s goal, Kane extended his points streak to 18 games, matching Phil Kessel and Eddie Olczyk for the longest streak by an American-born player in NHL history. He was moments away from losing the streak and the game, but Chicago and the streak survived. ”You look at the Americans that have played the game, and the two guys that are part of that record with Kessel and Olczyk, that’s some pretty elite company,” Kane said. ”Been a fun little ride here.” Hossa ended John Gibson‘s shutout bid during a 6-on-4 power play with 1:41 to play after a debatable tripping call against Ducks captain Ryan Getzlaf on Andrew Shaw. Keith got the tying goal with 26.6 seconds left after Kane and Seabrook kept the puck alive.The Ducks have lost seven of 10 after this gut-punch defeat, but they avoided suggestions that Shaw took a dive. ”I touched him on the back of the leg, and obviously he went down,” Getzlaf said. ”I don’t know how easy it was or whatever it was, but there’s 2 minutes left and we’re trying to battle them. I don’t think that’s a necessary call. It had nothing to do with the play. I just think it’s such a great hockey game. Both teams are playing so hard, and to end it like that, I didn’t think it was necessary.” Corey Crawford stopped 23 shots for the Blackhawks, who improved to 3-1-1 on their annual six-game trip while the circus takes over United Center.Andrew Cogliano and Chris Stewart scored early goals for Anaheim, and Gibson stopped 29 shots. ”You knew they were going to come eventually,” said Gibson, who got within moments of his second shutout of the Blackhawks in two seasons. ”They were going to get something. They found a way to do it.” After Anaheim’s season ended one victory shy of the Stanley Cup Final last spring, the clubs revived their rivalry last month in the United Center.This rematch included plenty of after-the-whistle chippiness, particularly from Ducks center Ryan Kesler and Jonathan Toews. They even dropped their gloves late in the first period, but the linesmen separated them before anybody could throw a punch. NOTES—Anaheim hosted the Hawks on Black Friday for the ninth time. … NL MVP Bryce Harper was in the Blackhawks’ dressing room after the game, chatting with Kane. …Teuvo Teravainen returned from a three-game absence with an injury. … These teams’ only remaining meeting of the regular season is Feb. 13 in the UC. INDIANAPOLIS—Paul George had 33 points and eight rebounds, and the Indiana Pacers beat the Bulls 104-92 on Friday night for their fourth consecutive win.The Pacers (10-5) have won 10 of 12 overall. Monta Ellis had 14 points, and George Hill finished with 10 assists.George has been the catalyst of Indiana’s recent surge, rallying from a rugged start to score 20 or more points in 11 consecutive games. And it’s not just a one-man show.Lavoy Allen had 12 points and 10 rebounds, and George Hill also pulled down 10 boards against the Bulls. Ian Mahinmi made 7 of 10 free throws in the closing minutes after making just 5 of 24 all season.The Bulls(9-5) just had a bad night. It shot a season-low 34.8 percent from the field.Nikola Mirotic scored a season-high 25 points for the Bulls (9-5), and Jimmy Butler added 16. The Bulls had won four of five.The Pacers swung the game with an early 17-2 spurt, which made it 19-9, and never trailed again.The Bulls pulled within four at 66-62 late in the third, but the Pacers finished the quarter on a 6-1 run, opened the fourth with back-to-back baskets and eventually pushed the lead to 16 late. ”You’ve got to do a better job getting back (in transition) against this team with the rhythm they’re playing in right now,” Bulls coach Fred Hoiberg said. George picked up another technical foul for arguing a call in the third quarter and looked as if he might get another in the fourth. But George calmed down and explained later that he is trying to improve his temperament.Butler and Derrick Rose typified the Bulls troubles. They entered the fourth quarter a combined 2 of 16 from the field and finished a combined 8 of 26. Rose finished with 10 points, five assists and a minus-19 player rating.The Bulls staunch 3-point defense held up against the league’s best long-range shooting team. After making a franchise-record 19 3s on Tuesday, the Pacers were just 8 of 28 from long range on Friday. The Bulls, meanwhile, used the late flurry, spurred by Butler and Rose, to go 11 of 26 on 3-point attempts. NOTES—Doug McDermott left with an illness after going 0 of 4 from the field. … Joakim Noah came off the bench and was shut out in nearly 19 minutes of action. He missed two shots and had five rebounds….C.J. Miles scored 16 points. … Indiana will begin a four-game Western swing by wearing its Hickory uniforms Sunday night at the Los Angeles Lakers.The Bulls host San Antonio on Monday night. NICEVILLE, Fla—Injury-plagued Illinois got three players back on Friday night who played key roles in a 72-58 win over UAB in a semifinal round game at the Emerald Coast Classic.Nunn, who missed the Illini’s first five games after having thumb surgery last month to repair a ligament, was one of four Illinois players to score in double figures with a game-high 18 points.Loren Black, who had played in three of the first five games but has been dealing with knee soreness after having surgery last month to repair a torn meniscus, added 12 points.Jaylon Tate scored 3 points after missing the past four games due to an open dislocation on the pinkie finger of his shooting hand.Illinois (3-3) led 28-23 at halftime but took control with a 14-3 run to start the second half. Malcolm Hill had six of his 12 points during the run.Maverick Morgan and Malcolm Hill also scored 12 points for the Illini, who will face fourth-ranked Iowa State in Saturday’s championship game.Chris Cokley had 13 points and six rebounds, and Robert Brown added 13 points for the Blazers (3-2).The Illini’s first seven games are being played away from the State Farm Center, which is undergoing renovations. During November, Illinois has traveled 3,926 miles and spent 12 nights in hotels. ANCHORAGE—Jaelan Sanford was 6 for 6 and Toledo went 12 for 12 from the free-throw line in the final 1:02 as the Rockets held off Loyola 82-74 in the Great Alaska Shootout Friday night.Devon Turk hit a 3-pointer with 1:05 left to pull the Ramblers within seven, 70-63, but the Rockets made them pay when they were forced to foul. Turk converted a 3-point play, cutting the Toledo lead to 72-66, and his 3-pointer with :24 left made it a five-point game, 76-71, but Loyola got no closer.Jonathan Williams scored 20 points to lead The Rockets (4-1), with Stuckley Mosley adding another 18. Sanford finished with 14 points and Nathan Boothe and Nate Navigato added 12 and 10 points, respectively.Ben Richardson came off the bench to lead the Ramblers (4-2) with 21 points. Turk added 15 and Earl Peterson and Milton Boyle each added 11. Bears, Cutler stun Pack at Lambeau on Brett Favre Night. GREEN BAY—Jay Cutler and the Bears spoiled Brett Favre’s big night back with the Green Bay Packers.Cutler threw for 200 yards and a score and the Bears held off the Packers on fourth-and-goal from the 8 with 22 seconds left for a 17-13 victory Thursday night.Aaron Rodgers’ throw to the end zone deflected off receiver Davante Adams’ hands in the cold rain. James Jones couldn’t hang on to a potential touchdown catch on third down.Cornerback Tracy Porter intercepted Rodgers’ pass with 3:19 left at the Bears 45 on the previous drive.The highlight of the night for Green Bay turned out to be the return of Favre, whose name and No. 4 was unveiled at halftime next to the team’s other retired numbers.The Bears (5-6) have won three of its last four. The Packers (7-4) lost a second straight home game.Jeremy Langford ran for 48 yards and a touchdown on 12 carries.Cutler finished 19 of 31. He outplayed Rodgers, who was 22 of 43 for 202 yards and a touchdown.Favre’s successor at quarterback stayed in the game after appearing to hurt his left arm in the third quarter after getting hit from behind near the elbow by linebacker Lamarr Houston while recovering a high snap.Rodgers said that he lost feeling in his hand after the hit for the rest of the quarter and into the fourth quarter. He said that he had regained full feeling in three fingers by the end of the game. ”It’s my left hand, I’ll be all right,” Rodgers said. Cutler was a little better, somewhat of a surprise given how poorly he has played at Lambeau in his career with the Bears. In his four previous games at Lambeau, all losses, Cutler had thrown 12 interceptions. 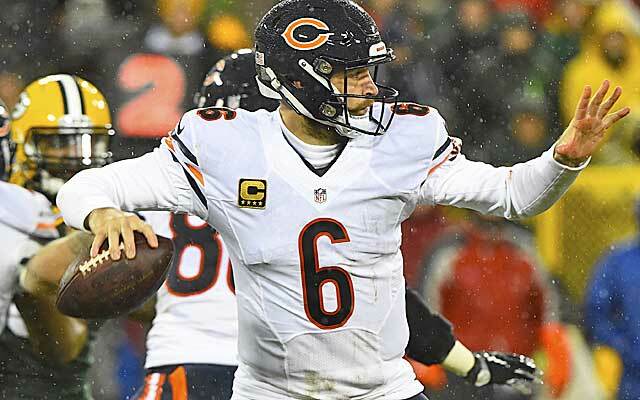 But with new coach John Fox and offensive coordinator Adam Gase, Cutler avoided throwing an interception.With driving rain drenching the field, Cutler calmly led the Bears on a clock-eating drive in the fourth quarter that kept Rodgers on the bench with the Bears leading 17-13.Cutler hit Marc Mariani on third-and-10 for a 21-yard gain to the Packers 44 with 7:38 left. Then the Packers caught a break after Cutler mishandled a shotgun snap on third-and-11 to set up a punt.The Packers couldn’t capitalize. They moved the quickly up the field on their final two drives only to come up short.Robbie Gould’s 21-yard field goal in the fourth quarter for the Bears was the only scoring for either team in the second half in a game played dreary conditions.It put ball security at a premium.Eddie Lacy fumbled deep in Bears territory in the second quarter after getting hit from behind. Cutler cashed in on the Bears next drive by finding Zack Miller for a 3-yard touchdown pass that tied it at 7 with 6:03 left in the half.Lacy ran for 105 yards on 17 carries, and also scored on a 25-yard catch-and-run. ANCHORAGE—Devon Turk scored 25 points with six rebounds and Loyola knocked off San Diego 67-57 in the Great Alaska Shootout.Turk was 10 of 15 from the floor, including five 3-pointers, and the Ramblers (4-1) shot 50 percent as a team. Earl Peterson added 13 points with six assists and Milton Doyle chipped in with 11 points and five helpers.Duda Sanadze’s 3-pointer with 12:10 left put San Diego up 44-42, but Loyola scored the next seven points – including a 3 by Turk – and never trailed again.There was one basket in the first 4 minutes of the game – a layup by Peterson. San Diego used an 11-4 run midway through the first to take its first lead and Sanadze’s 3-pointer with 49 seconds gave the Toreros a 28-25 lead at the break.Sanadze led San Diego (0-4) with 20 points and eight boards. Brett Bailey finished with 13 points. SAN JOSE—Patrick Kane had two assists to extend his career-best scoring streak to 17 games, leading the Blackhawks to a 5-2 victory over the San Jose Sharks on Wednesday night.Kane set up Brent Seabrook on the first goal and also got a helper on Duncan Keith’s second-period goal to give him 28 points during the streak.Jonathan Toews and former Shark Andrew Desjardins also scored for the Hawks. Andrew Shaw added an empty-netter for the Blackhawks, who improved to 2-1-1 on their annual circus road trip. The six-game swing concludes this weekend with games in Anaheim and Los Angeles.Corey Crawford made 27 saves.Brent Burns and Patrick Marleau scored for the Sharks, who returned home from a 6-0 road trip to lose once again at the Shark Tank. San Jose fell to 3-6 at home this season after dropping 22 games here last season – their most since 1996-97. The Sharks had earned the most points at home in the NHL over the previous nine seasons.Martin Jones made 21 saves.After a slow start in their first game back from the perfect road trip, the Sharks found their legs late in the first period and tied the game at 1 when Burns scored on a one-timer from Joe Pavelski on the power play. It was San Jose’s first goal at home with the man advantage all season after 21 failed chances.But the tie lasted just 88 seconds before Ryan Garbutt sprung Toews on a 2-on-1 and the Captain beat Jones with a shot high to the glove side.The Blackhawks added to the lead midway through the second period when Keith sent what looked like an innocent shot in from the boards only to see it elude Jones to give the Visitors a 3-1 lead.The Blackhawks then killed off two power plays early in the third before Marleau made it a one-goal game when he beat Crawford with a wrist shot off a faceoff win in the offensive zone with 8:40 to play.Desjardins restored the two-goal lead 1:07 later when he scored his first of the season on a rebound.Fresh off their annual stop in Las Vegas during their November road trip when the circus is in town, the Blackhawks started fast. They got the first eight shots on goal and took a 1-0 lead midway through the period when Kane set up Seabrook with a one-timer that beat Jones.San Jose took more than 13 minutes before getting its first shot on goal. NOTES—The Blackhawks have one regulation loss in their past 10 games against the Sharks. … Dainius Zubrus made his debut with San Jose on the fourth line after signing a contract Tuesday. … Sharks D Justin Braun was scratched with an upper-body injury.